The idea originated in Sweden and has found favour with world stars. A new gluing technology was established during the development of the DONIC Ovtcharov Senso V1 blade. DONIC's top players Dima Ovtcharov and Adrian Crisan participated in the first tests and were delighted by the fantastic feel and unbelievable power of this blade. The 7-ply blade with a hard walnut outer veneer was developed to meet the new challenge that the VOC ban will present to players. It is designed for high speed smashes and topspin. The inner plies are a carefully adjusted combination of medium hard and medium soft veneers. A revolutionary new gluing technology has been applied which results in additional rigidity to each single ply. 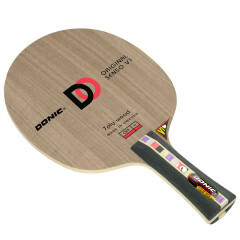 Donic Blade Ovtcharov Senso V1 is beeing added to cart.